When you are made aware of the fact that the year Kung Fu Panda: Showdown of Legendary Legends is also the year the new movie is coming out, you might see the significant use of the property. After all the movies are all about fighting and thus lends itself perfectly for the brawler that is Kung Fu Panda: Showdown of Legendary Legends. Kung Fu Panda: Showdown of Legendary Legends could have had a killer of a story, a spin-off of one of the movies, an alternate universe where the realm is threatened, but alas, it is not so. The story is very, very shallow. Apparently Po nagged Shen to hold a tournament and that’s what he got. Was anything omitted from this? No, that’s it. If you want background information you’ll have to look at the glossary of the characters. Even in the story mode that presents that laughable excuse of a plot there is no other story. Not a simple cut scene after you’ve beaten the ten waves of challenges, nothing. It’s disheartening, knowing that after you’ve fought your way through it all you aren’t even rewarded. 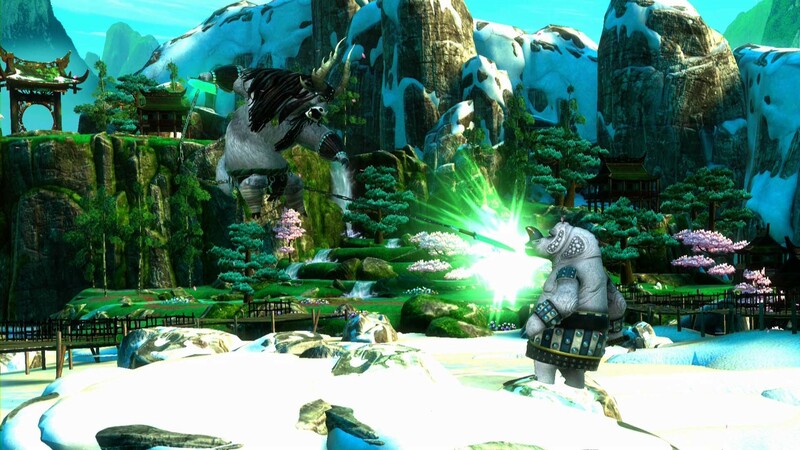 With Kung Fu Panda: Showdown of Legendary Legends on a wide range of hardware it has to be said that the graphics on the PlayStation 4 are really well done. Even the background audience are in full 3D, sure they are mostly clones, but still. The attacks are all flashy and the action is very chaotic once you start fighting with four players on one map, but it all works rather decently. The animations are really well done and the opening cut scene of the story mode is something you’ll want to see more of, sadly this isn’t the case. Sound wise Kung Fu Panda: Showdown of Legendary Legends isn’t something that’ll blow you away, but it does what it’s supposed to do. At the start of every fight the characters will make a quip on their species and the battle will commence, in the background you’ll hear an oriental (Asian? Being politically correct can be rather difficult at times.) theme that is rather bombastic. The game’s soundtrack has a lot of similarities to the music in the movies, so that’s a nice nod to the film franchise. Jack Black’s voice is only used in the opening cut scene of the story mode which is a shame, especially because it sounds so lacklustre. 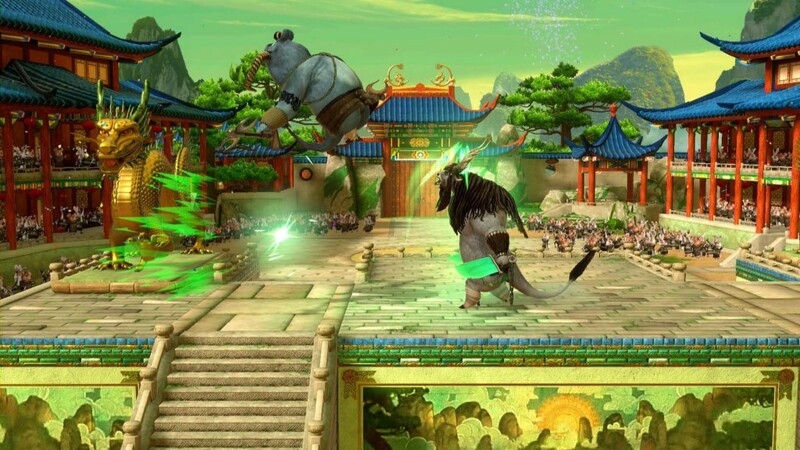 Kung Fu Panda: Showdown of Legendary Legends is a fighting/brawler game. Upon inspecting the game you might see something that might irk you. It boasts DLC. The last thing you want to do is have a nondescript text about your game and include the fact that if you aren’t enticed enough about the content you can immediately buy some DLC. Especially not of the player has just paid about 50 euros/dollars or about 33 British pounds for it. This is especially a kick in the nuts when you do find out what you get when you start to play the game. There are 20 characters, all unlocked and ready for you to play. Next to that, there are three stages for you to choose from if you want to play against friends or online and there’s a story mode with the same story every time and a character glossary. Sure you can get a lot of fun out of it as a party game and luckily the game has local multiplayer but still that only makes the game about half of what’s the current price. It’s not that Kung Fu Panda: Showdown of Legendary Legends is a bad game, because the gameplay is perfectly functional with only slight hitbox detection erring and with the various characters all playing entirely different. It just feels lacking. There could have been so much more. Unlocking characters through playing the story mode, levelling up characters, unlocking alternate uniforms, extra levels, anything. The controls are really easy to learn but difficult to master and this is because commands are different if you press them either in quick succession, double tapping the directional and then the commands or in mid-air. 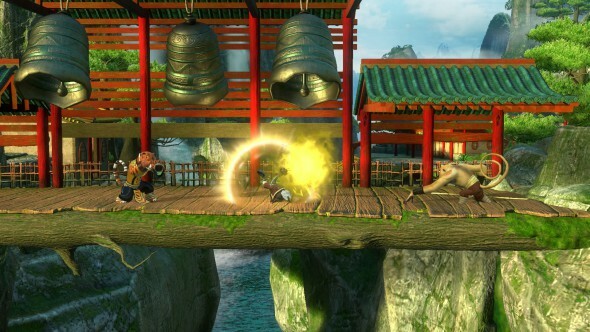 This allows for very flexible gameplay and makes it so the frantic fights are never the same. The difficulty is rather high at moments even at the lowest settings so if you are new to the genre, you might lose several matches. Luckily you’ll have retries in the story mode, so you can learn the ropes and your characters fighting style to your heart’s content. If you are looking at the movies as a referring point to buy the game, then don’t bother. The game doesn’t do the movies justice. 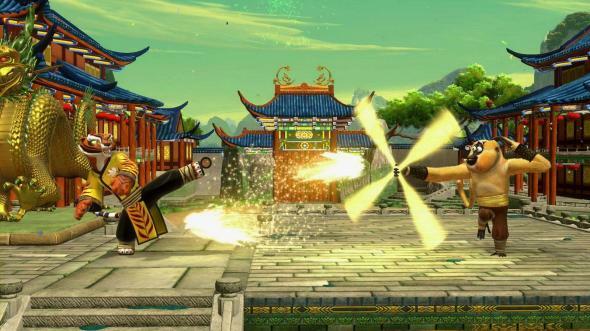 If you are looking for a fighting game in the vein of Smash Bros, then this might whet your appetite. It won’t overthrow Super Smash Bros, but it will give you some hours in which you’ll try your hardest at flinging the enemies off the screen.